The other day I was flipping through some fun blogs and I came across this great idea. Later I was at Wal-Mart, and saw some ric-rac and remembered it, so I grabbed the stuff I needed to make this darling necklace. It was really, really easy! Unfortunately, I can remember what blog I saw it on, so sorry for not giving credit where credit was due. 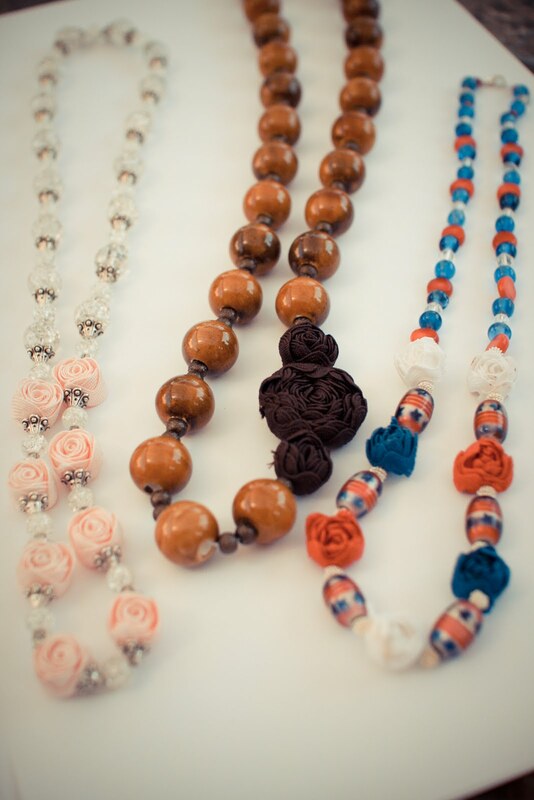 :( She said that a member of her family had returned from a mission to Brazil with gifts of necklaces like these for them. The ladies looked carefully at the fun necklaces and realized that the rose beads were made simply with ric-rac, so they tried it for themselves. Well. I had to try it too! All you do is string beads with a needle and strong beading thread. 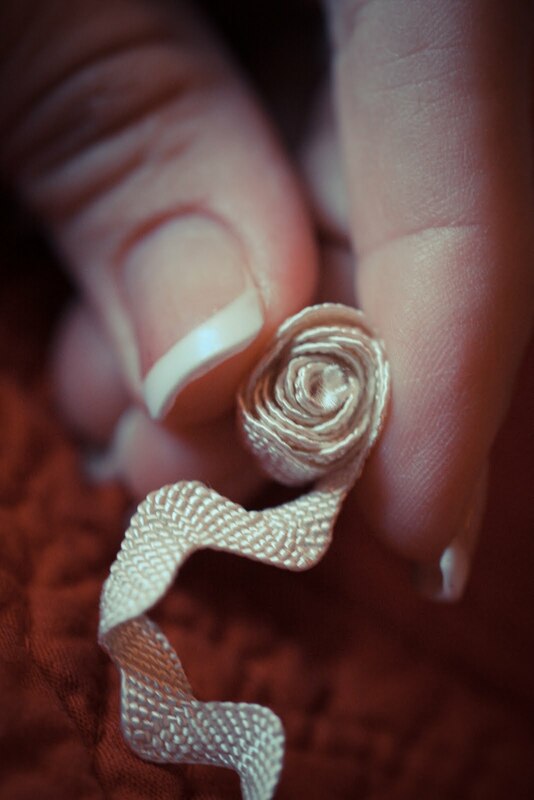 When you get to the place in the necklace where you want a roses bead, you simply roll up a length of ric-rac, as tightly as possible until you get the rose to the size you want, then cut the rest of the ric-rac off. I would recommend uncoiling the first one so that you can use it to measure all the others strands of ric-rac so they will all be the same size, then roll it back up again. For a nice medium sized rose with medium sized ric rac, I cut mine to 12 inches. 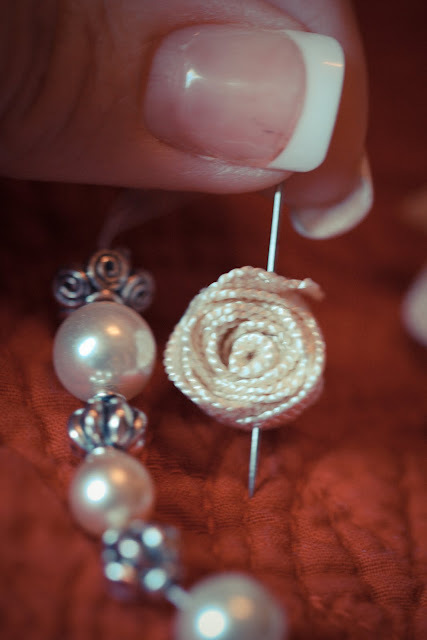 Then simply stick the needle of the beaded strand right through all the layers of ric-rac. Be sure that you poke the needle into the rose close to the cut end of the ric-rac, that it goes through the middle of the rose, and that it catches the outside layer of ric-rac on the way out, so that nothing comes unraveled. 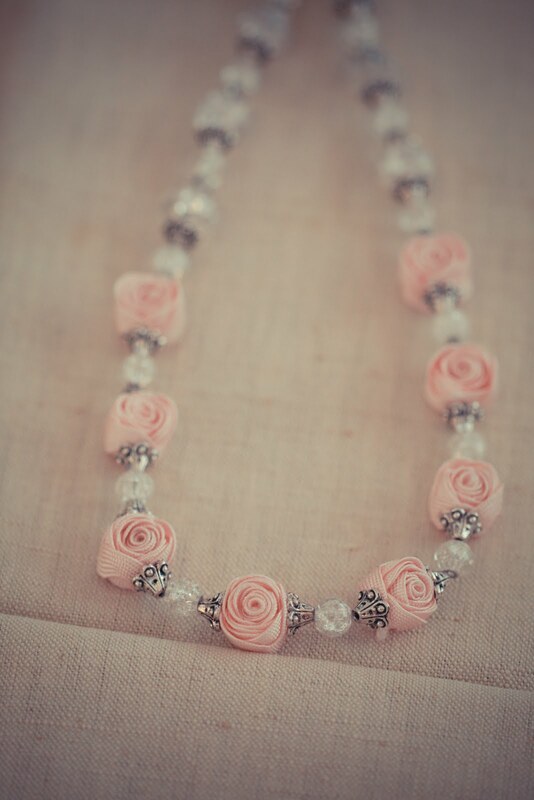 Then continue beading and adding ric-rac roses until the necklace is done. 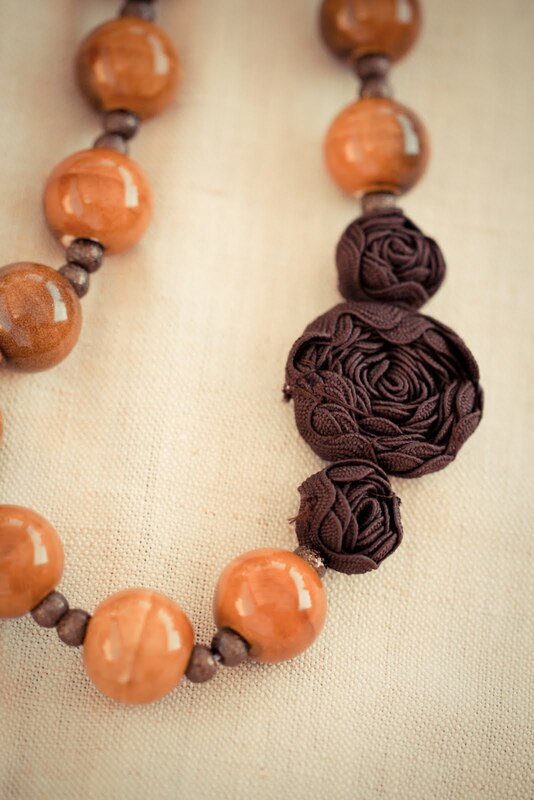 You can add a clasp, but if it is long enough to slip over you head you don't need to bother. Just ties if off. Easy. This sweet necklace cost me less than 5 bucks! The ric-rac was $2, and the beads were less than $3. They were already strung like this. 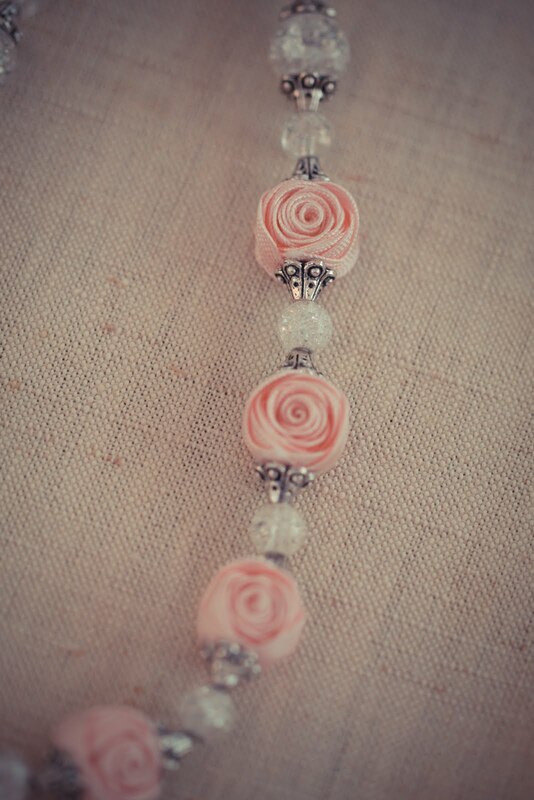 I just had to re-string them in the same order, replacing some of the large beads with roses. It really came out darling! 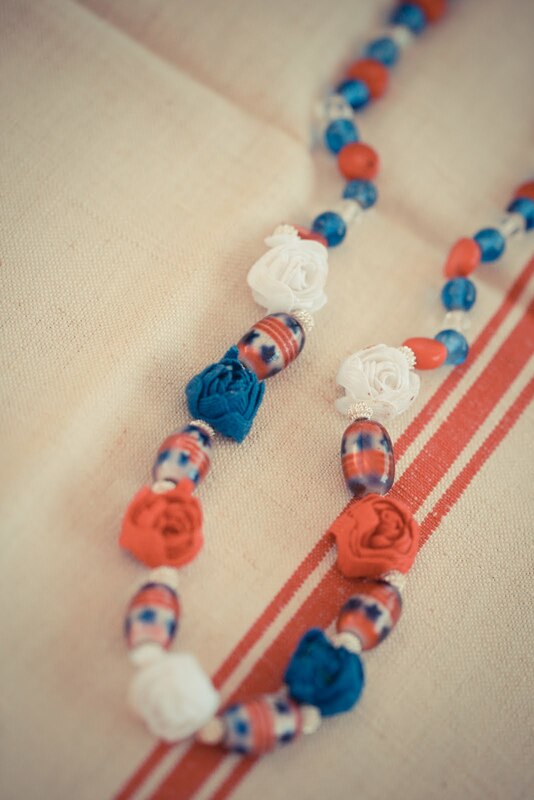 Then Saturday night, about 11pm, I decided I needed a patriotic necklace for the 4th of July, so I found some scraps of red, white, and blue ric-rac in the Attic (well, the garage) and some patriotic beads from an old broken bracelet, and my cute sister-in-law Elizabeth helped me put this one together. 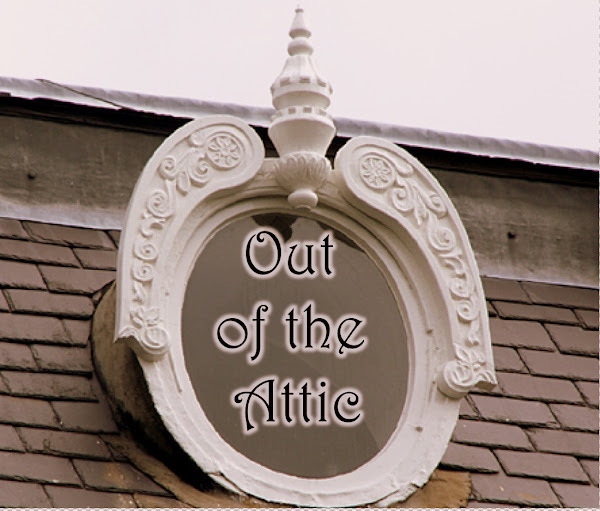 The ladies at church, including Attic Gal Alysa, just loved it! My cute and very creative sister Mindy is visiting and she saw my necklaces and had to run out and buy some beads and ric-rac of her own. She made a giant ric-rac rose. So clever! She had to add a few stitches with a matching thread here and there to keep it together. It is chunky and fun and perfect. Genius, Mindy! So that's it. Clever, quick, and cute! Try it. You just might get hooked on ric-rac roses too! Hello, I was looking at some blogs through my Pinterest boards when I came across your ric-rac roses necklace, which is beautiful, and I remembered that my sister sent me a box of craft stuff she didn't want (can you believe it?..lol)and there were several packs of ric-rac in many different colors and sizes. Now I know what to do with them! Thank you for the idea and I love your blog...I will check in from time to time and/or share patterns. Thanks for the idea! They are just too stinking cute! Thanks for sharing, I might have to dig out my old bead box and use some up. I loved this idea and tried it out but the roses don't stay right side up when wearing the necklace(the roses swivel on the string), and the underside doesn't look great when its on. Any ideas on how to get them to stay right side showing?